I am a firm believer in the importance of daily vitamins. I don't believe we get enough nutrients from the food we eat and for those of use who live in the North we certainly don't get enough sunshine so we don't get enough Vitamin D. I might be able to convince myself that my daughter eats healthy enough to get enough vitamins in her diet- she loves her fruits and veggies - but that still doesn't take care of the lack of sunshine. However, I know for a fact that my sons don't get enough vitamins in their diet. Aiden, with his Autism, has some intense food aversions and many years ago we were given some very sage advice. We were told to give him his daily vitamins and then take our time working on the food issues. That way we wouldn't have to worry about him getting scurvy (or something equally scary). The thing is we went through a LOT of different brands of kids vitamins over the years and Aiden hated them all. He hated all those chalky tasting chewable ones. Actually all 3 of my kids hated them. All those ones based on cartoon characters sat unused on my kitchen counter until I finally threw them out. My kids would NOT eat them. They said they tasted gross. Then one day, a couple years ago now, I stumbled upon IronKids multi-vitamins gummies and decided to give them a try. I am so glad I did! The kids loved them and we've been using them ever since. That's how you know I really love them- we've been buying them at the store for a good two years now and I have no intention of stopping! I was excited to join the IronKids ambassadors program because it gave us a chance to try out several other kinds of IronKids gummies too. For the last few weeks we've been trying the IronKids Gummies Omega-3's, IronKids Gummies Vitamin D, IronKids Gummies Calcium, and IronKids Omega-3 Bursts. The Vitamin D gummies are a huge massive hit with all 3 kids. They love them and would eat them like candy if I let them! I tried a couple and they are very tasty! They are perfect for the extra long winter we are having these days. My sons really like the Omega-3's gummies but my daughter prefers the Omega-3 Bursts. I don't know why they prefer the different ones but they all tell me they each think the other tastes better. The kids haven't gotten into the Calcium gummies yet but I think at this point it is just too many vitamins to try all at once :). They do think the shape of the calcium vitamins is cool though- they say they look like little cows. 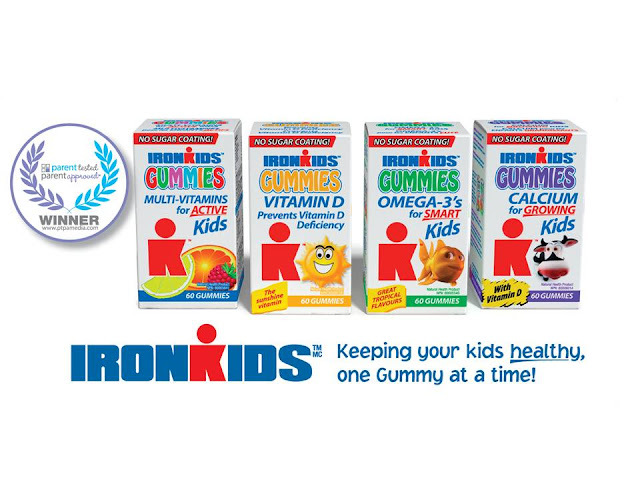 The bottom line is that we love IronKids gummies in our house. I never have to argue with the kids to take their vitamins and if I forget to offer them the kids remind me! My husband and I have also been taking the Adult Essentials gummmies multi-vitamin and love it. I have been recommending IronKids for years and I will be continuing to do so- give them a try and I am sure you won't be disappointed :) . I am participating in this blog tour by Influential Media on behalf of IronKids. I received compensation as a thank you for my participation. The opinions I express are my own.